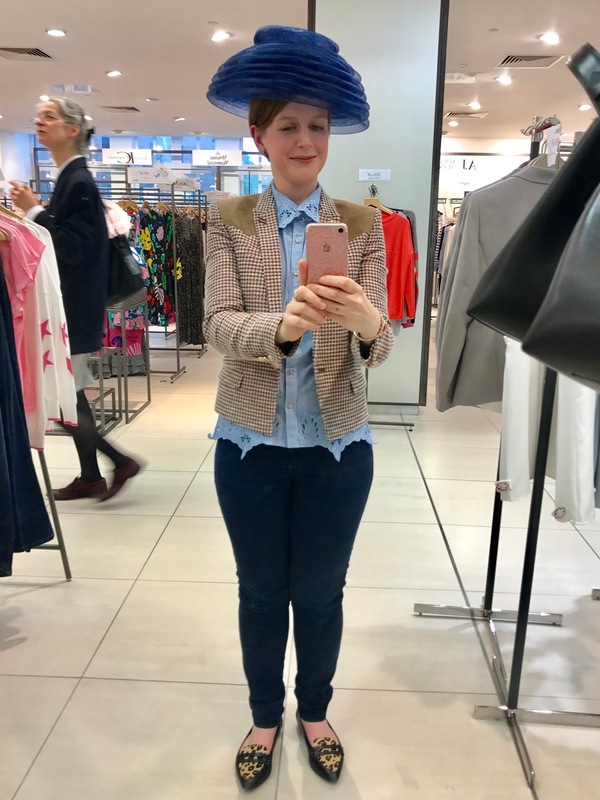 Since I've been a fashion blogger, I've been lucky to meet some really amazing, talented and inspirational people (and been lucky enough to make some wonderful friends along the way!). I've formed friendships in places I'd never have expected to find them, and have really enjoyed uncovering my loves of both fashion illustration and fashion history through working with The Bowes Museum and visiting various exhibitions up and down the country. I write about fashion because it is my passion; an outlet for my love of all things designer and couture, so much so that it is easy to get lost in my little world and forget about those who might be reading my ramblings! 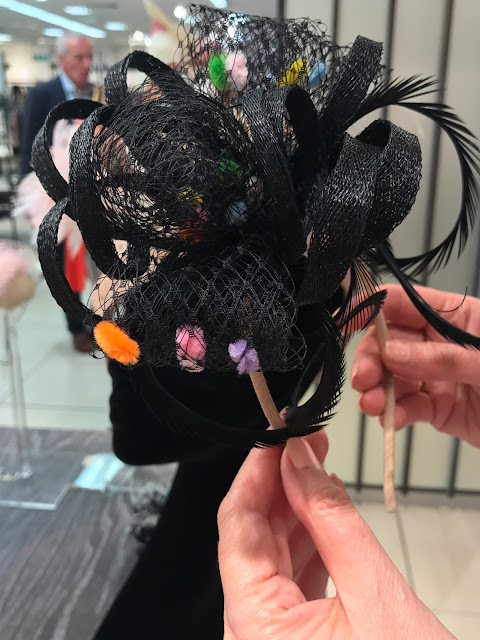 One lady who stumbled across my little corner of the internet, is the amazing couture milliner Margaret Woodliff-Wright who I am pleased to say contacted me to tell me all about her creative world, and we stayed in touch. 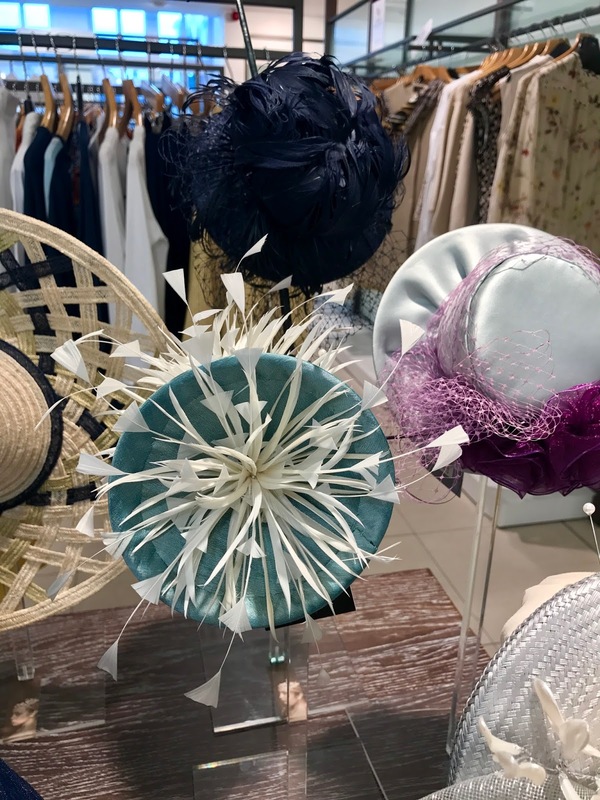 I could spend hours pouring over images of her intricate and beautifully made hats, so when she invited me to come to Fenwick York and view her latest collection as part of Fenwick's Summer Garden Party, I jumped at the chance to finally meet her in person! Fenwick's Summer Garden Party took place on Thursday 18th May and was a fantastic event in which they offered amazing discounts throughout the store, with 20% off fashion and 15% off beauty (and some further discounts for the early birds between 9 and 11am) perfect if, like me, you're always looking for designer bargains! 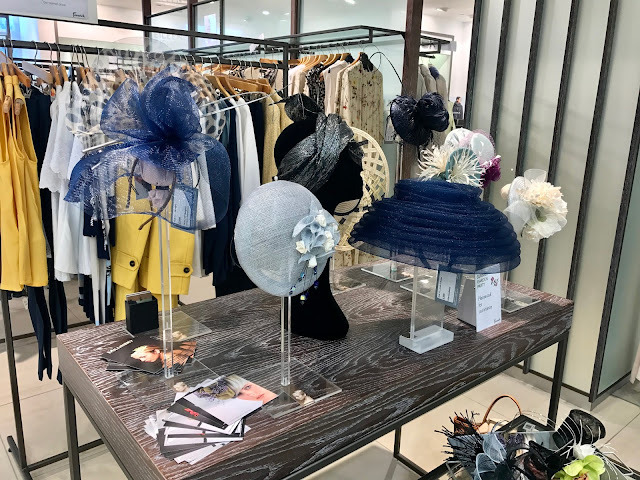 It's worth noting too that as part of Royal Ascot week, Fenwick were also showcasing work from different milliners up and down the country. Fenwick often run amazing promotions across their group, so it's always worth checking their website here to see what's up and coming in your local store (mine's Newcastle, and my boyfriend and I often visit on a weekend-it's by far our favourite place to shop and the best place to visit for the latest in designer labels in the North-East; we love it!). I hopped off the train in York on Thursday afternoon and hot-footed it straight to Fenwick; I couldn't wait to meet Margaret and see her beautiful collection. I love Fenwick in York and after a browse around the handbag section and their amazing beauty hall, I headed upstairs to find Margaret on the first floor, in amongst the designer womenswear. She welcomed me with open arms and it was lovely to finally meet her in person. She introduced me to her friend Erica, who was modelling one of her newer designs, Summer Rosa priced at £375, which looked absolutely stunning! The timing of my arrival couldn't have been better, as Erica and Margaret were about to take a tea-break at the instore Carluccio's and kindly invited me to join them; a great opportunity to get to know them both a little better! We chatted about work, and Margaret told me a little more about her Spring collection. I should point out here that her work is absolutely stunning-she is an incredibly talented lady! 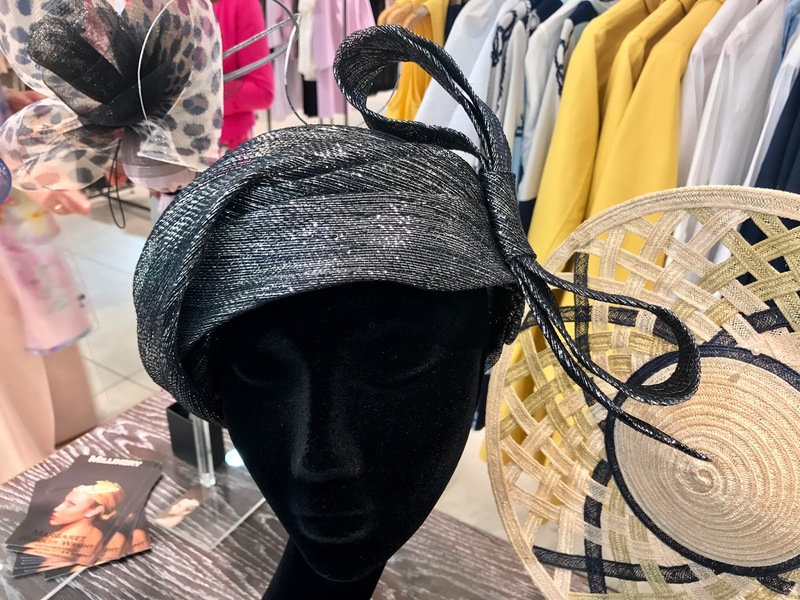 All of her pieces are completely handmade; she studied Couture Millinery at Leeds College of Art and alongside creating her seasonal collections, she also takes commissions and creates everything at her studio in Northumberland. I have seen many of her pieces online, but nothing could have prepared me for how sensational they'd be in person. 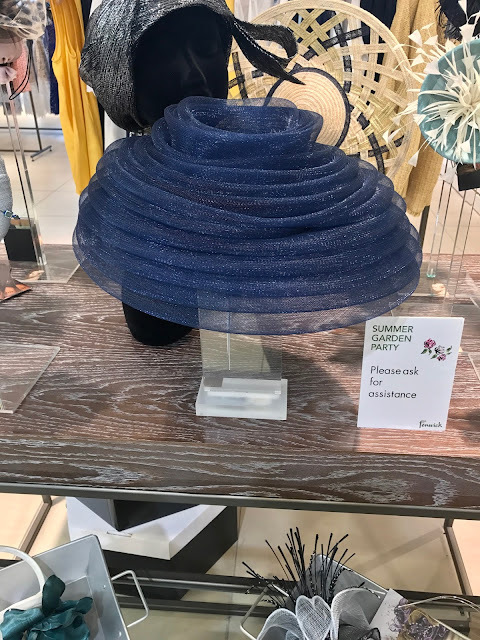 Her pieces in this collection range from £125 to £375 and there really is something to suit every style, taste and colouring! After tea, she told me a little about each piece in turn (and even let me try on some of my favourites!). The first that drew my eye was 'Georgia' priced at £250, a truly beautiful piece made from stiffened lace and finished with a Swarovski focal button. 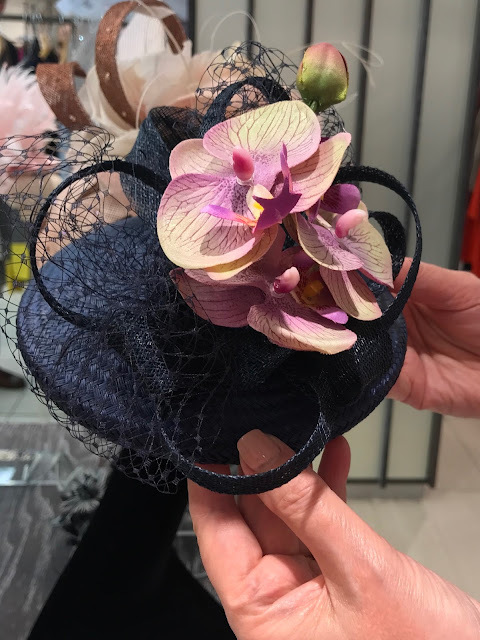 'Georgia' sits beautifully on the right side of the head on a couture covered headband. The colouring wasn't right for me as I'm very pale, but on darker hair with a dress in a similar hue (or against a contrasting colour) this would look sensational-I was so in love with it! Next I tried on a black half-turban which was equally as beautiful and unlike any headpiece I've ever seen before. I loved its detail, but I think you'll agree that it was better suited to the lovely Aimee from social media and marketing than it was to me! The piece I was most excited to try though was an Audrey Hepburn inspired number (I LOVE Audrey!). 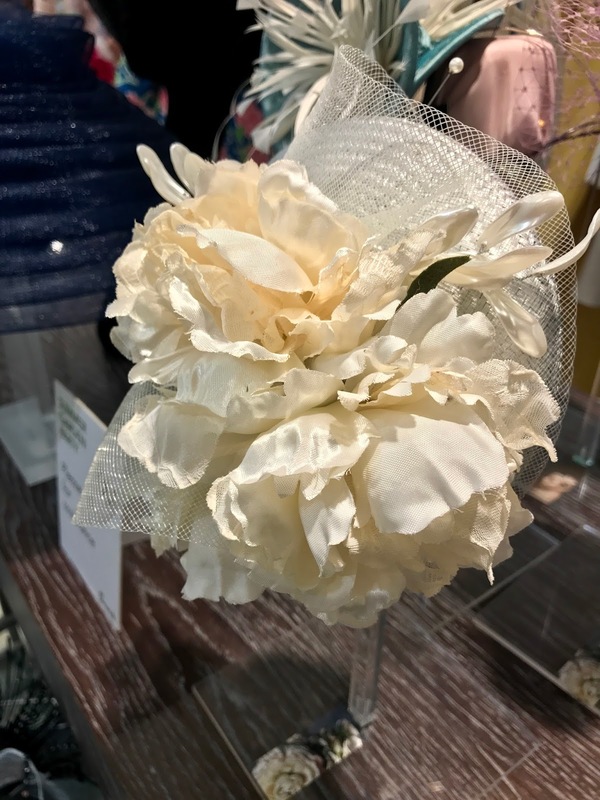 Based on a 1950s piece by Dior and set on a wide satin covered headband, the 'Lady Johanna' priced at £300, was very easy to wear and was the most beautiful colour. My favourite to wear however was this little pale blue flat cap, set on couture hat elastic. I let Margaret expertly place it on my head and I loved the way it looked against my short hair. 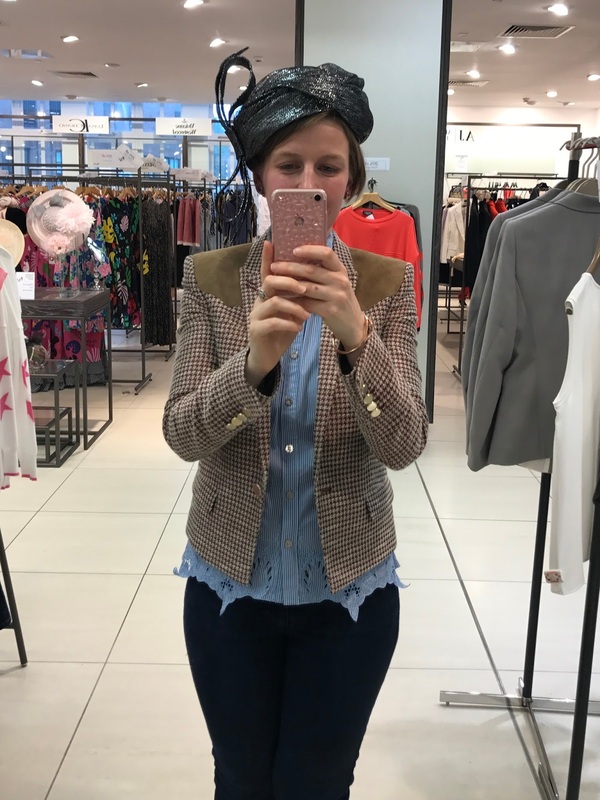 Pictured with Margaret having lots of fun trying on all of her styles! Front centre: Charlie Aqua, £200, 10cm base. Pure silk aqua covered cone, miniature silk roses, two cut coque spiky mounts. To be worn to the right and attached with a metal headband. Francesca, £375, 15cm button base. Hand-rolled and dip-dyed cotton organdie roses and lilies set on a pale pink sinamay button. To be worn to the right and attached with couture elastic. Another of my favourites, Brooke Ivory, £125. Ivory coque feathers with diamanté detail, set on sinamay silver with silver tipped feather and diamanté fascinator, cut coque feathers. Worn to the right on a satin-covered narrow headband. Lily, £375, 16cm base. 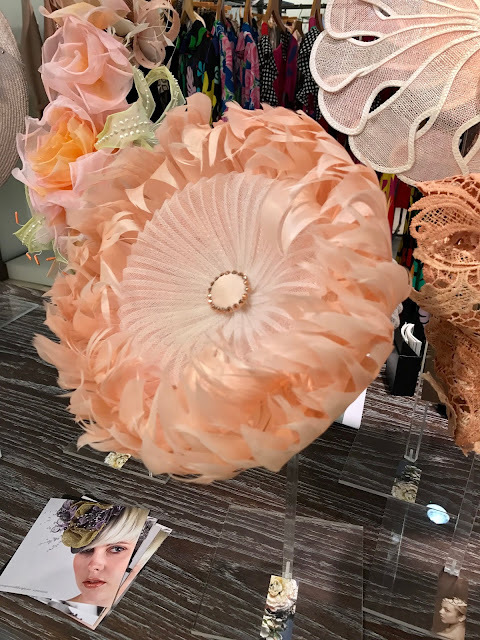 Vintage rose hand-finished goose nagoire feathers, ivory circular crin centre with Swarovski detail. Worn to the right on a couture headband. Round hat, back of photo: Eloise, £375, a pale-pink parisisal saucer, the crown is covered in silver cocktail fabric. Saucer finished with silver crin bow, Swarovski diamantés and silver crin detail to the underside. Worn centrally, attached to a silver fabric padded headband. Centre, left: Gina, £375, Hand-finished ombré coque feather headpiece. Over 150 feathers with Swarovski highlight quills. Worn to the right on a metal headband. Annabelle, £200, 10cm button base. 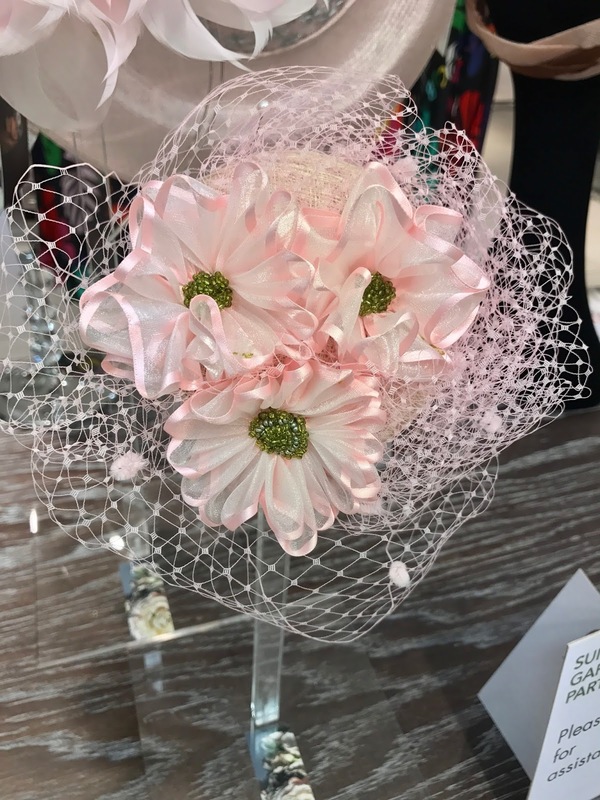 Pale-pink sinamay button with three pleated organza ribbon roses, green hand-beaded centres and massed pink veiling. Worn to the right, attached with couture hat elastic. Lucille Boater, £200, 20cm base. Soft grey satin, aubergine hand-rolled ribbon roses, veiling and beaded quills. Worn to the right and attached with a comb and couture elastic. 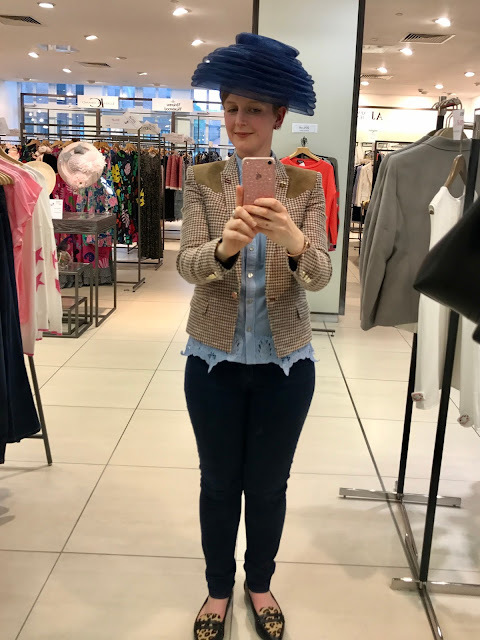 Margaret also told me that this top hat was constructed from flat pieces, a style she often uses when she teaches her hat making workshops. One is set on a couture-finished headband, the other on a base which is the suitable diameter needed to be allowed entry at Royal Ascot. 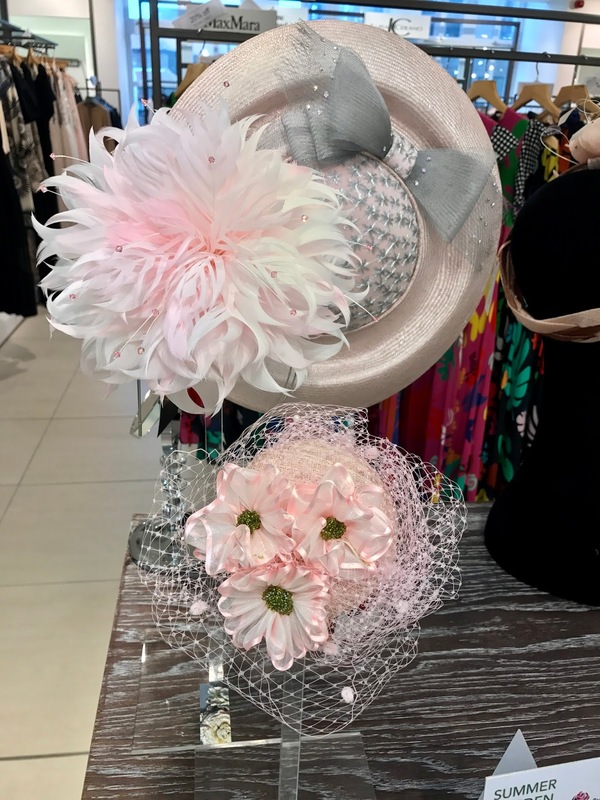 These pieces are the ones that she is going to be teaching her workshop attendees to make on May 27th; imagine being able to make your own beautiful couture hat! Margaret's workshop takes place at Gallery 45, Felton and starts at 10.30am. Full details can be found on her Facebook page here. Sadly the day was drawing to a close, and as I headed away to grab a bite to eat before catching my train home, I was so thankful to my little blog for allowing me to meet another wonderfully creative person. 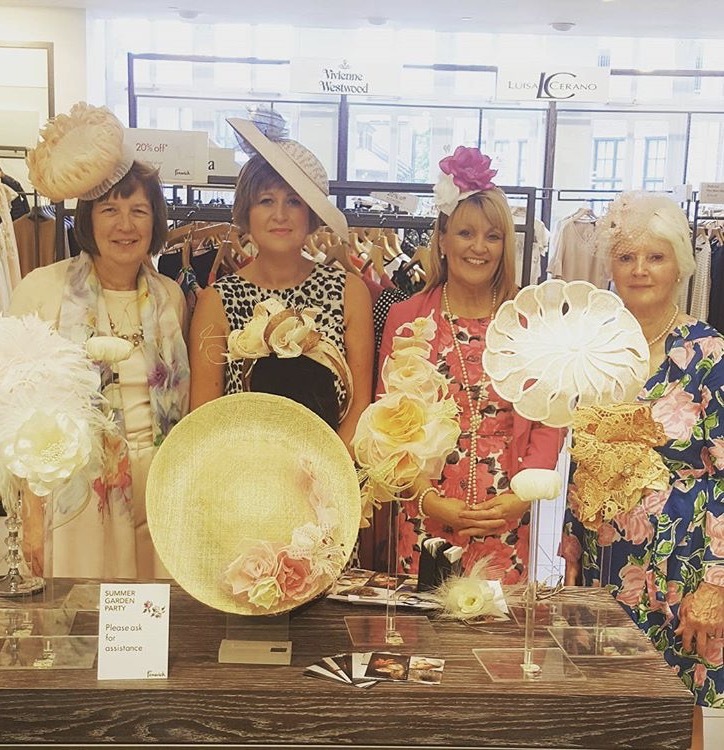 I also enjoyed getting to know some of the wonderful staff at Fenwick; I loved the Summer Garden Party event and can't wait for the next one! If you're interested in any of the hats featured in this post, they are all available to be purchased. You can do so by contacting Margaret via her website or emailing info@margaretwoodliffwright.com. All images are my own, other than those credited to other sources. I hope to profile Margaret in a future blog post, so please look out for that! But for now, thanks to both Margaret and the staff at Fenwick York for being so welcoming and allowing me to cover such an amazing couture collection. Thanks Chloe for your lovely comments! It was amazing to meet Kayleigh on Thursday, it was the real icing on the cake during an action packed day. Everyone was really supportive and we got lots of great feedback from customers & staff alike. Have you thought about the weekend workshop? Unfortunately Kayleigh is busy working on Saturday, but if you haven't planned your weekend yet, and are thinking of going to the races this summer, please do join us on Saturday. To register for the workshop just follow the link and register at Gallery 45 - which is a great place to visit if you haven't already been up to Felton. By the way I love your Insta page!